The Sweep1 command fits a surface through a series of profile curves that define the surface cross-sections and one curve that defines a surface edge. 1. Select a single rail curve. 2. 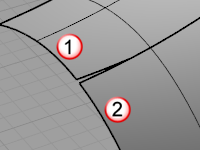 Select cross-section curves in the order that the surface will pass through them. ● Select open curves near the same ends. ● For closed curves, adjust the curve seams. ● To create a single surface, the cross-section curves need to be compatible. If you use the Refit within option, the cross-section curves are refit with compatible cubic splines. ● If you do not use the Refit within option, the cross-section curves are made compatible by degree elevation and knot addition. (The original curves are not modified.) You can specify the fitting tolerance for the cross-section curves with the Refit within option, but the fitting tolerance for the rail curve is controlled by Document Properties > Units > Absolute tolerance. ● With closed rail curves, the first cross-section curve you select is added to the end of the list if you choose to create a closed surface. Select connected edges based on the curve continuity of the connection between segments. 1. Inside a command that accepts chain selection, type chain. 2. Select first chain segment. The Point option creates a surface that begins or ends at a point. Use this option only at the start or end of the curve series. The Freeform and Roadlike options determine how the frames along the rail are made. In many cases, the resulting surface is the same with all options. The cross-section curve rotates to maintain its angle to the rail throughout the sweep. The Freeform option generally uses the rail-tangent cross-rail curvature direction. Sweep1 Roadlike options calculate the way cross-sections are propagated along the rail based on the tangent direction of the rail and a fixed direction specific to the option. Roadlike Top sets the fixed direction as world z, Front uses world y and Right uses world x. To determine the movement of a cross-section, one frame is found at an existing cross-section location and another is calculated at the desired location along the rail. The difference between those frames defines the movement of the cross-section. A frame is a 3-D point and three direction vectors. It can be drawn as something that looks like the Rhino world axes icon. It describes a unique coordinate system in space. 1. The rail tangent and the fixed direction vector (if they are not parallel) define a plane. The cross product of the tangent vector and the fixed direction produces the normal vector of that plane (frame x) perpendicular to both of the input vectors. 2. The cross product of frame x and the rail tangent produces another vector, frame y, perpendicular to the tangent and frame x. 3. Taking the rail tangent as frame z, there is a unique 3d frame at a specific location along the rail with its mutually perpendicular x, y and z coordinate directions. 4. The rotation and translation between two of those frames determines how a cross-section will be moved from one location on the rail to another. If the rail tangent and the arbitrary vector are parallel, they do not define a plane and the cross product does not produce a vector, so the frame is under-defined, and it will twist around the rail tangent since that is the only defined information. For the Right and Front options, the same orientation rules apply with respect to those construction planes. If the rail is a surface edge, the cross-section curve will twist with the surface edge. If the shapes are tangent to the surface, the new surface should also be tangent. The Closed sweep option creates a closed surface, continuing the surface past the last curve around to the first curve. Note: This option is only available after you select two cross-section curves. The sweep is linearly blended from one end to the other, creating sweeps that taper from one cross-section curve to the other. Otherwise, the sweep stays constant at the ends and changes more rapidly in the middle. If the sweep creates a polysurface with kinks, the component surfaces will be untrimmed. Allows reversing the direction of the cross-section curves. Creates the sweep without doing anything to the shape curves. Rebuilds the shape curve control points before creating the sweep. Shape curves reconstruct with non-rational curves, so as to enable the continuity option. Refits the shape curves before creating the sweep. Shape curves are reconstructed with non-rational curves, so the continuity option can be enabled. Simple sweep works in cases where the shape curves intersect the rail at rail edit points. This option generates simpler surfaces in cases when the curves are perfectly set up. The surface inherits the structure of the input curves. Refits the rail curve like using the FitCrv command. Click to display a preview of the output. If you change the settings, click Preview again to refresh the display. Fit a surface through profile curves and two edge curves. Fit a surface through profile curves that define the surface shape. Fit a surface through a network of crossing curves.